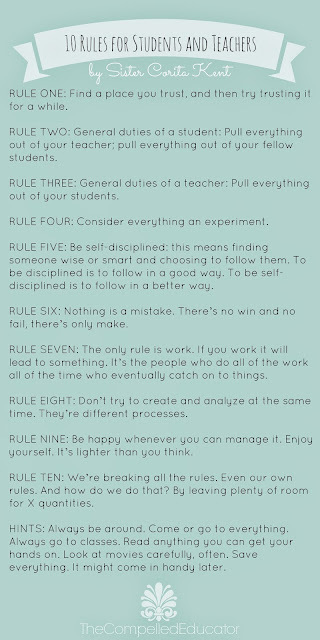 I stumbled across the 10 Rules for Students and Teachers, written by Sister Corita Kent in 1968. 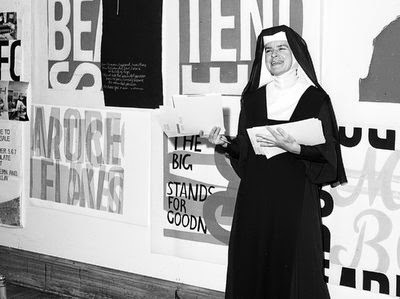 Sister Corita Kent was a peace activist, artist, and college professor. You can learn more about her at http://www.corita.org/. RULE TWO: General duties of a student: Pull everything out of your teacher; pull everything out of your fellow students. RULE TEN: We’re breaking all the rules. Even our own rules. And how do we do that? By leaving plenty of room for X quantities. HINTS: Always be around. Come or go to everything. Always go to classes. Read anything you can get your hands on. Look at movies carefully, often. Save everything. It might come in handy later. Feel free to download by clicking on the picture above.